Wooden mirror/picture frame, stained, made in Camp Petawawa,1940-1942. The frame is constructed of wood, with 3 main parts: the pivoting frame, the frame support, and the base. 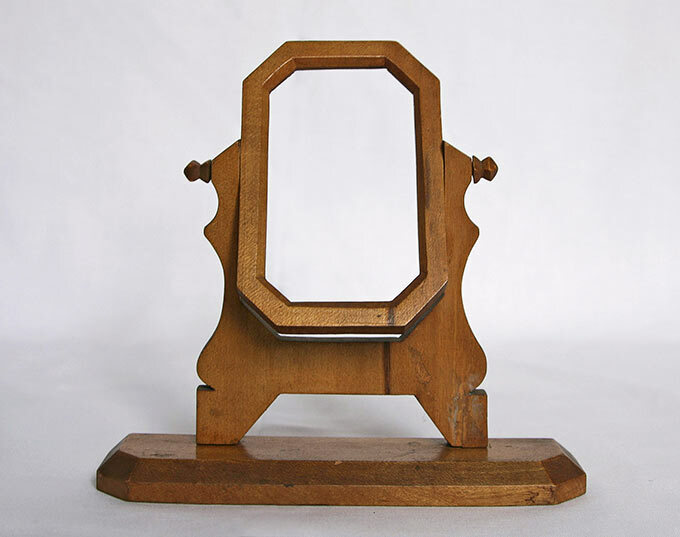 The frame itself is an elongated octagon (5 inches high, 3.1 inches wide). The long base is bevelled and measures 7.2 inches long and 1.8 inches wide. The base has an inscription written in pencil: "Entrato al Campo il 7 Agosto 1940 / usciato il 24 Maggio 1942 totale 22 Mesi dentro", translated as "Entered Camp August 7, 1940 / left May 24 1942 a total of 22 months interned". This frame is part of a group of four collected and preserved by the family of internee Girolamo (George) Capponi. The frames along with other wooden objects in the collection, may have been made by Capponi himself. He had written to his wife asking for wood-working tools.